Recycling has become a “big deal” for humans in the years since I was born! As a kid, I remember burning newspapers in the burn-barrel by our garden, and throwing a massive number of tin cans in the garbage which doubtless wound up in some landfill. Now, the Oregon Department of Environmental Quality (DEQ) proudly reports that in 2013, Oregonians recycled 53.9% of our post-consumer waste. Nice try, but we don’t even come close to Mother Nature’s record of recycling: 100%! 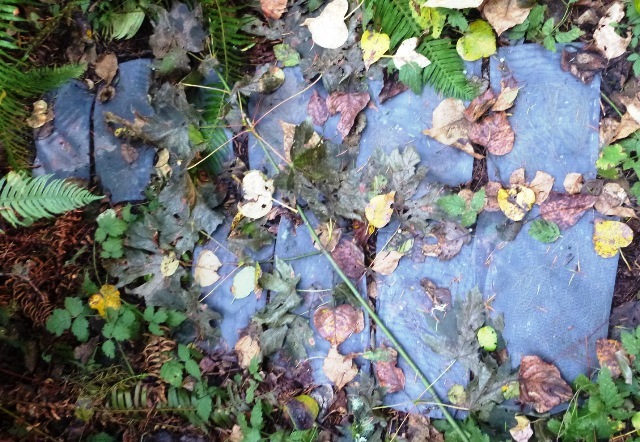 Here at Tryon Creek State Natural Area (TCSNA) the forest constantly recycles biomass like leaves, logs and dead animals. Sometimes it’s fast, and sometimes it’s slow, but it’s always thorough! We need look no further than some of the TCSNA’s old logs and stumps to see that sometimes recycling takes quite a while. This rotting log is approximately 18” in diameter. It is on the side of Old Main Trail and hasn’t changed much in the last 5 years, and I don’t expect it to completely disintegrate any time soon. 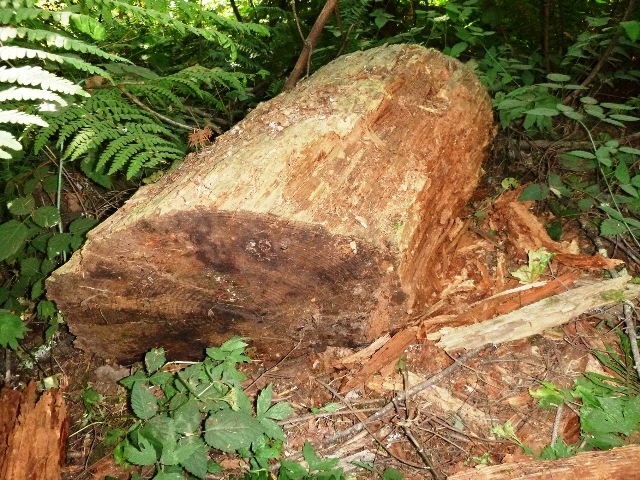 In fact, research foresters report that fallen Douglas-fir (Pseudotsuga menziesii) logs sometimes take almost 200 years to completely decay! This might even be here for over another 100 years! But other stuff “recycles” faster, doesn’t it? Absolutely! In order to see how fast things are recycling (“decaying”) at TCSNA, I set up a small study. 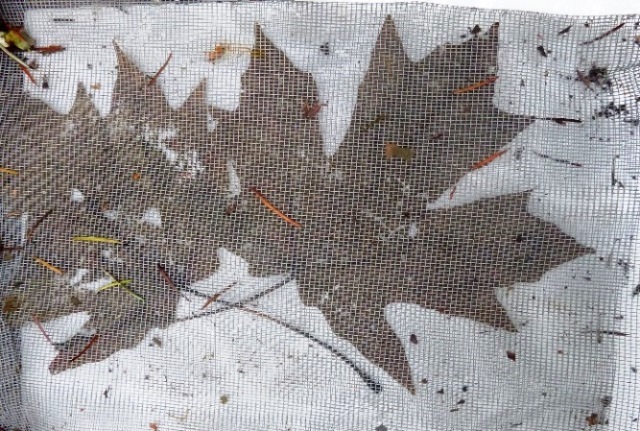 Scientists who want to study recycling in the forest often use things called “litter bags.” (The term “litter” here refers to the fallen leaves, twigs and branches on the ground, not to candy wrappers and used Kleenex!) 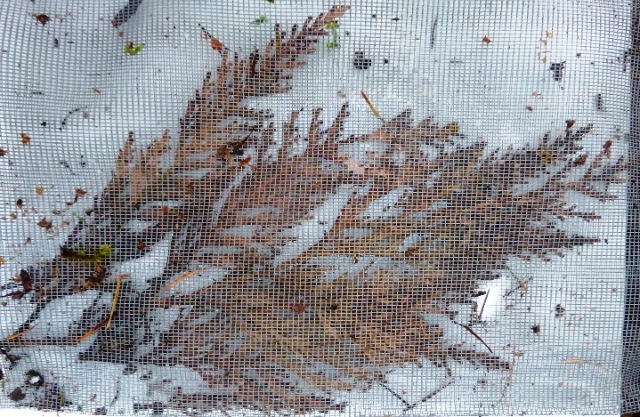 I collected the plant material for this study off the ground, so this material was ready to start decaying. I cut square pieces of window screen to make my bags. 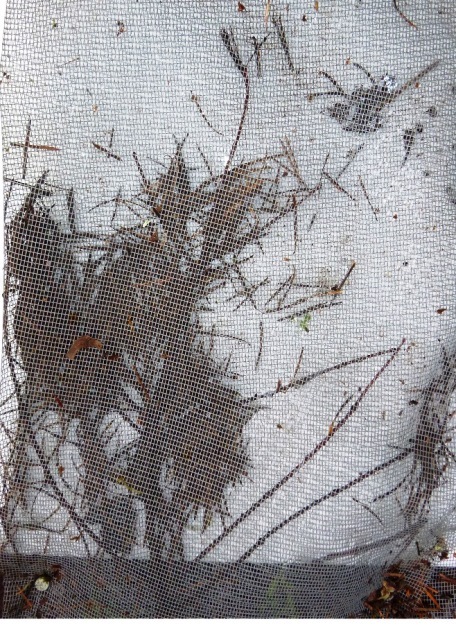 I placed the plant material on half of each piece of screen, and then folded the other half over the top, and stapled it shut. I fastened each bag to the ground using four big nails, one in each corner. 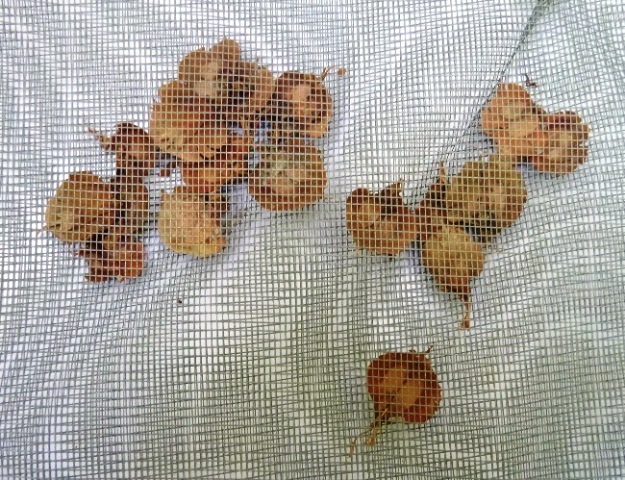 I set up the bags in an area of TCSNA where they wouldn’t be disturbed. I put out some bags on September 11 and others on September 13, 2014. 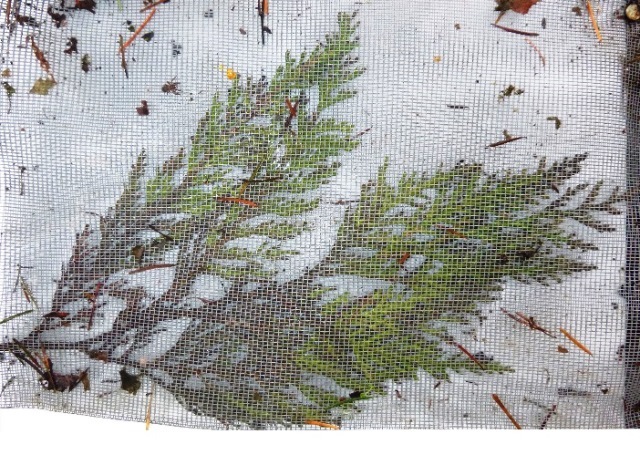 In each bag, I put one of five things; Alder (Alnus rubra) leaves, bigleaf maple (Acer macrophyllum) leaves, western redcedar (Thuja plicata) twigs with their green scaly leaves, Douglas-fir twigs with needles, and finally, the scales from a Douglas-fir cone. I had two bags of each type of material. Then I fastened the bags to the ground. 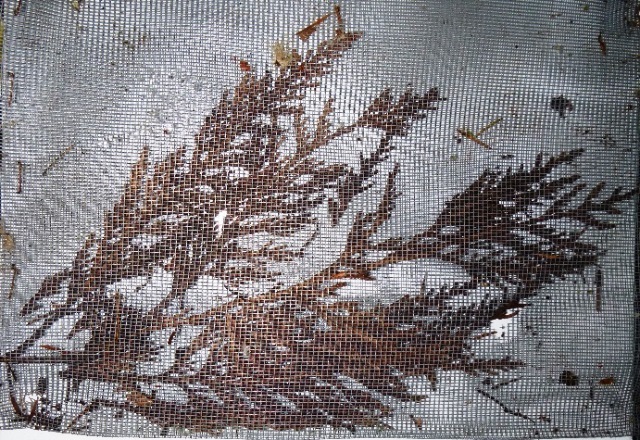 This is what it looked like on September 13, 2014, after the full study was installed. You can see some of the green leaves inside the bags. 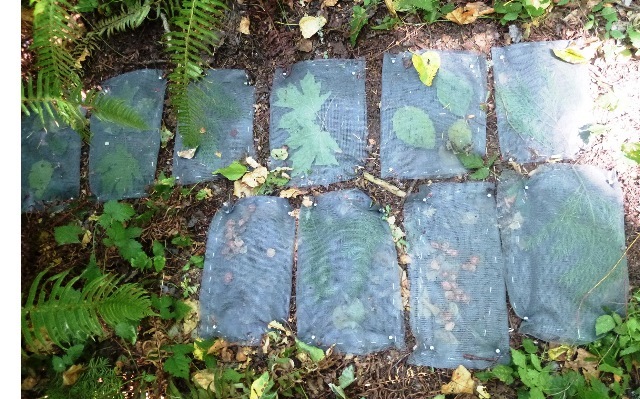 Litter bags fastened down on the forest floor. I took pictures of every bag each month. When I took pictures I brushed off the top of the bag, loosened two of the nails holding it to the ground, and slipped a piece of white plastic underneath the bag to provide contrast to the material inside the bag. I refastened the bags and replaced the litter following each photo. Below are some highlights. 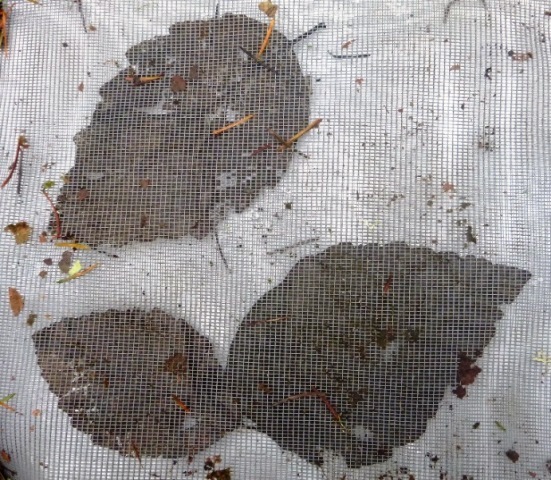 By October 3, 2014 some natural forest litter had fallen on the bags. This is totally realistic. There were times when the litter bags were almost completely covered with natural litter from the trees. 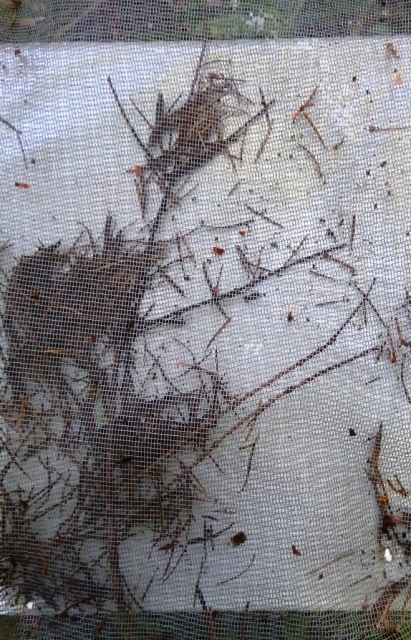 The litter bags after 20 days in the forest. Having the litter inside bags did create a certain amount of unrealism. This point was made dramatically during my March 2015 visit to the litter bags, when the little critter pictured below was crawling over them. 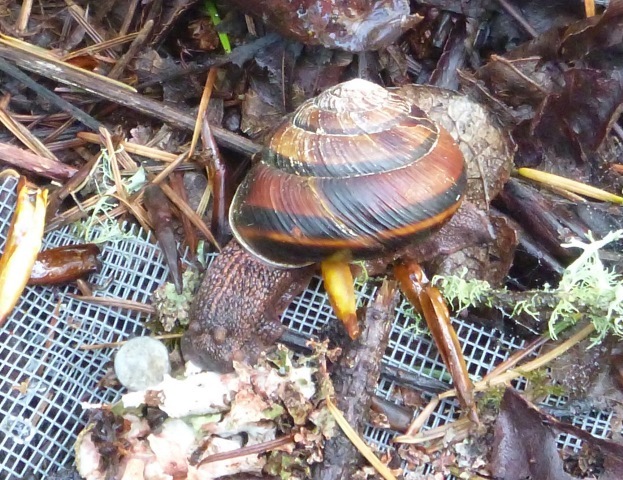 To the extent that snails might accelerate litter decomposition, my study was only an approximation of reality. This snail will never get at the litter in my litter bags. Sorry, little guy! So let’s see the decay process! 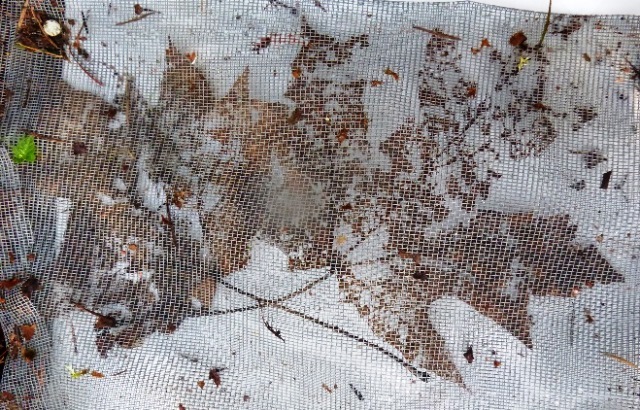 The decay rates for the samples in my litter bags varied a lot between species, and sometimes between particular leaves of the same species. 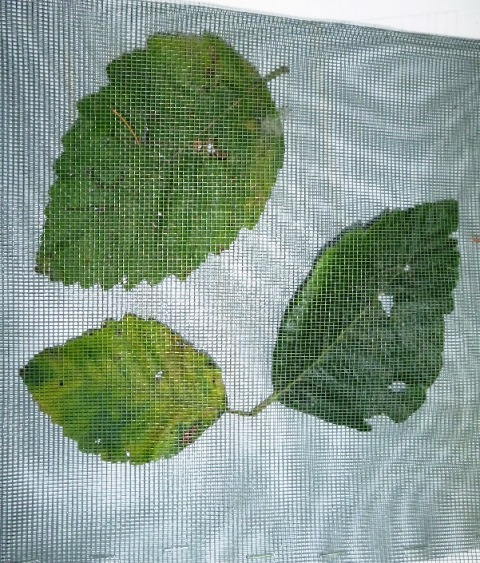 The alder leaves decayed dramatically over the course of a year. After 79 days, the leaves had lost their color, but had only just started to disintegrate. 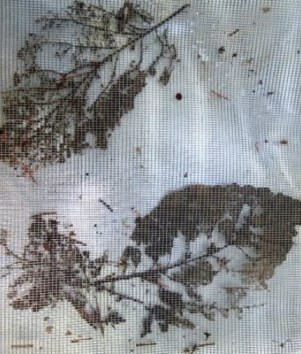 By the end of March, the leaf in the upper half of the photos was pretty much reduced to the mid-rib (the tough “vein” going from the base of the leaf right through to the tip) and the lateral veins. 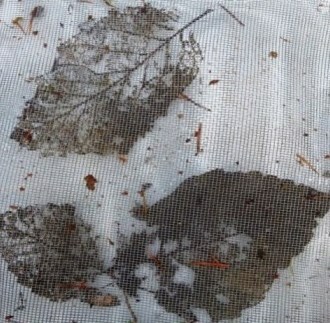 In contrast, the leaf in the lower right hand corner still had a lot of the leaf blade left. 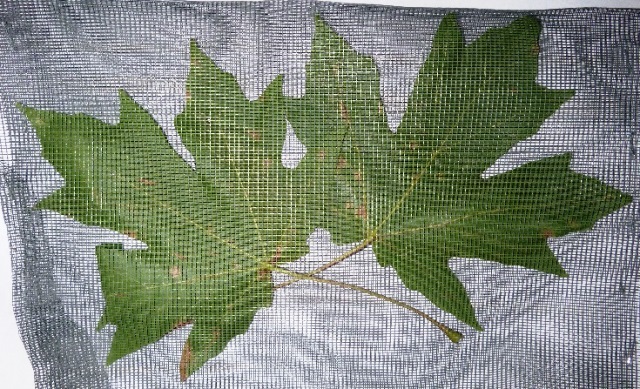 Once again, the maple leaves were significantly decayed after the first year, but the petiole (the stalk that attaches the leaf to the branch) being more “woody” than the leaf blade is still largely intact. Western redcedar is loaded with hydrocarbon molecules that impart decay resistance. The most amazing thing was that in November 2015, after more than two months on the ground, most of the redcedar branch was still green! (Confession time: The other redcedar branch had turned completely brown at this point.) After over a year on the forest floor, this branch, and its needles, was still largely intact. 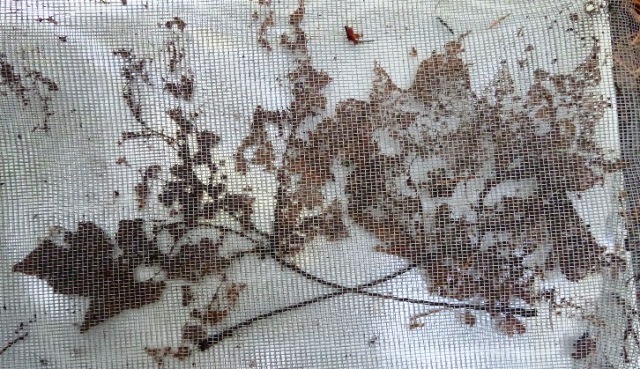 Unlike the alder and maple samples, this bag includes the woody twig in addition to the foliage. 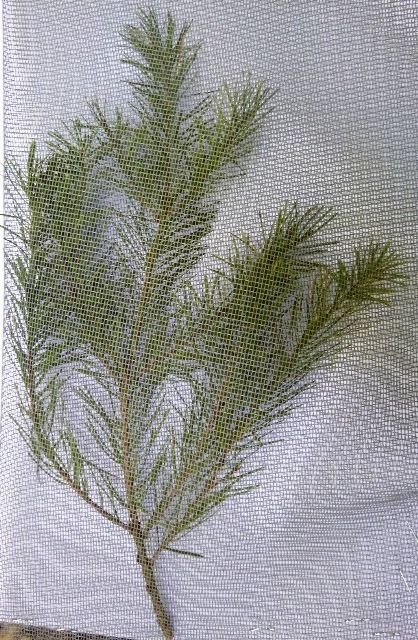 The Douglas-fir twig rapidly shed all its needles, producing an un-photogenic combination of a bare twig, and clumps of dead needles. 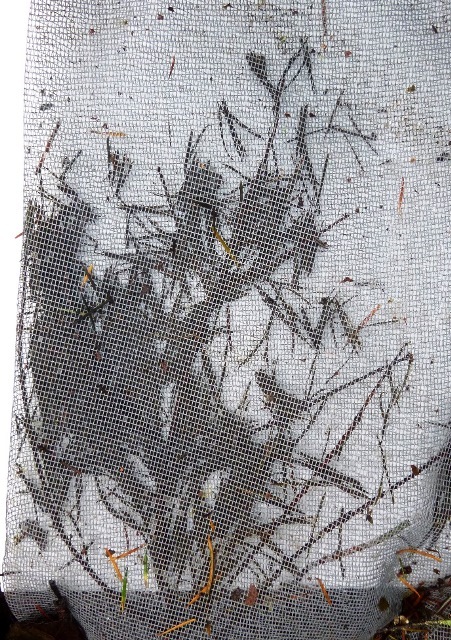 The slight movement of the bags in preparation for taking photos is what caused the needles to gather in clumps. The needles, though brown and scattered, are individually maintaining their structural integrity. 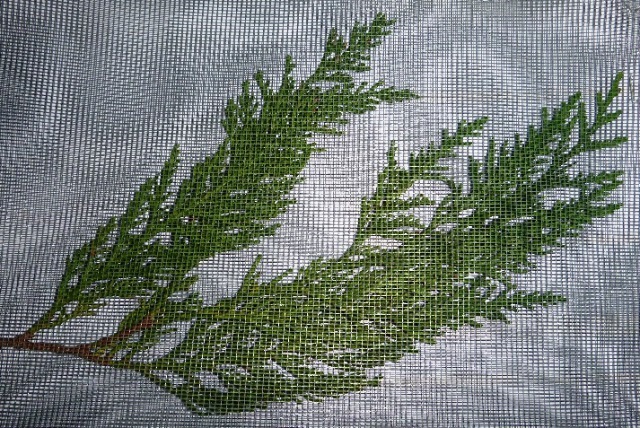 As with the western redcedar discussed earlier, the presence of hydrocarbon molecules in the needles and stem are helping resist decay. The Douglas-fir cone scales are tough and woody. To tell the story of their decay in the first year, we only need two photos. 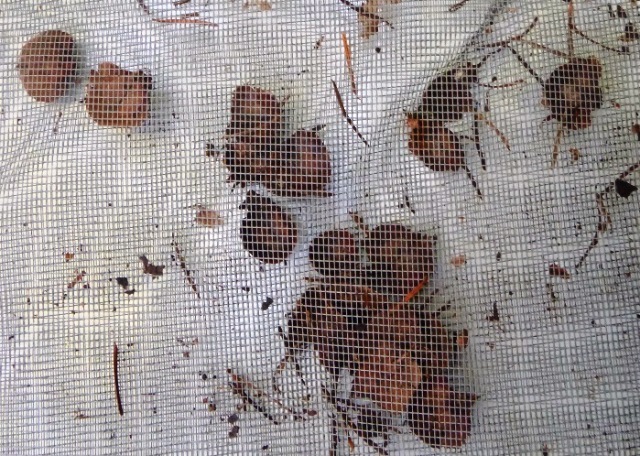 In the 12+ months in the litter bag, there was no perceptible change in the Douglas-fir cone scales, except they are now slightly darker! Again, shifting the bag for photos results in shifting the scales around within the bag. As organic matter decays, important chemicals like nitrogen and phosphorus are slowly released to soil for growing plants. The partially decayed organic matter in the soil dramatically increases its moisture holding capacity, and water infiltration rates, among other things. Better than most of us, Mother Nature knows that the rotting leaves and stems of today are the key to the towering trees of tomorrow! Without recycling, there would be no forest as we know it.